If you follow my instagram account at all, you'll know I started an Office Tea Club. Many of my co-workers have noticed my tea habits, and often ask questions about why I have an electric kettle, why I drink loose leaf tea, why I have insane amounts of teaware on my desk, etc. Many of the questions were out of curiosity for tea, so I thought it would be fun to carve out a small amount of time every week for a few of us to get together, relax and have tea. I brew up a tea or two and we taste, talk about how we feel about the tea, learn a little bit about it, and just have some time to decompress. It's turned into something I look forward to every week, and I have fun selecting teas for us to taste. If you are interested in starting your own office tea club, I urge you to do it! You'll be surprised at how many people are interested in trying tea, and the time you spend together communicating in a more casual manner will help build team morale. You may even get to know each other a little bit better which is especially important in settings where you're sitting at a computer all day, only talking to people via email or phone. I find that everyone is a bit friendlier to each other now that we have tea time once a week. So, this week I was thinking we needed to shake things up a bit. We've done pure and flavored teas, even tea cocktails. But we hadn't delved into the world of puerh. I recently received my monthly Global Tea Hut package, and there was an intriguing puerh blend called Zen Blend. I know shou puerh is a bold choice for folks that haven't had it before, but everyone's got to start somewhere, right? I wanted to further our tea education. It was described as being very relaxing, and I thought we could all use a bit of that. "It's like sitting on a comfy leather sofa in a moldy basement"
"The flavor you'd get if you took an old leather bound book and steeped it in water"
"The essence of a flooded college library"
I find I've learned quite a bit about how creative my co-workers can be based on what they have to say about the tea! 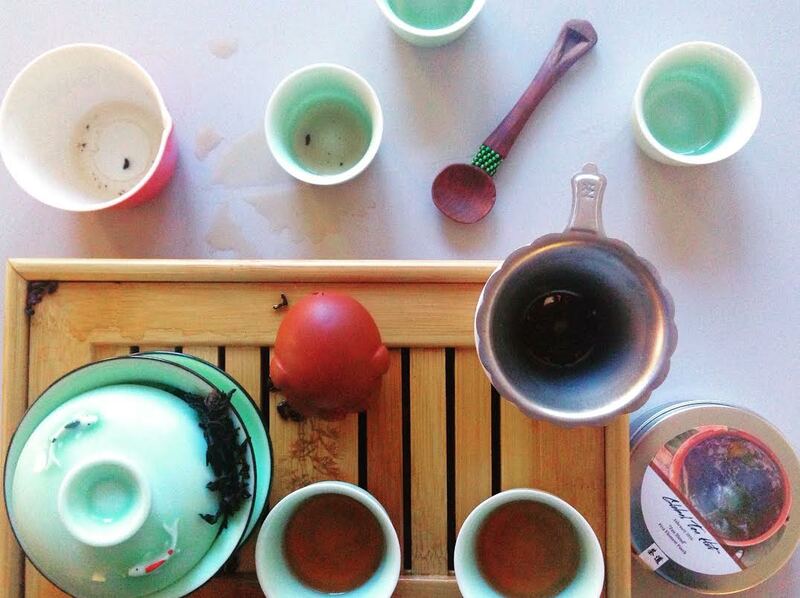 So they weren't in love with the puerh, but it opened the door to teas they hadn't heard of or tasted before. I was surprised that while we were getting a bit tea drunk, I wasn't the least bit jittery. Relaxed, just as the blend promised. This surprised me because the caffeine in tea always makes me a little shaky, even shou puerh. But this was definitely different. I think next week I'll try to find a nice sheng puerh so we ca compare the flavor and aging process. Do you share tea with your co-workers? If you set up an office tea club, I'd love to hear about it! Or I'd be happy to discuss if you need any help in creating one. I am not employed; however, I do wonder what sort of employment that you have allowing you to have desk filled with tea items and sharing tea leaves around the office and to finally establishing a tea club? Similarly to having a book club which is usually done outside of work at cafe or nearby book shops. I can't recall if I have read what sort of work that you do; if it is tea related than seemingly good for a tea club meets. No matter, how delightful to have co-workers interested in what you like. Thanks for sharing and looking to reading more of tea club office get together. Pu-er is challenging to like or not like.